Discussion in 'Playback Devices' started by Ronald Epstein, Jan 5, 2017. LAS VEGAS, Jan. 4, 2017 /PRNewswire/ -- (CES, Booth #17300) – Sony Electronics announced today new exciting audio products for 2017 all designed to support a more enhanced, connected, and immersive listening experience for consumers. This includes an advanced audio/video receiver (AVR), several new sound bars, and the highly anticipated Ultra HD Blu-ray universal player. These devices provide users the freedom to choose the best combination of devices to fit their unique entertainment needs. "With this new lineup of products, consumers – especially home theater enthusiasts – have the opportunity to create a truly immersive audio and video experience in their home," said Mike Fasulo, President and COO of Sony Electronics. "With Sony's expertise throughout the entire process, from the studio to the living room, Sony Electronics is uniquely positioned to provide customers with the best possible listening and viewing experience. 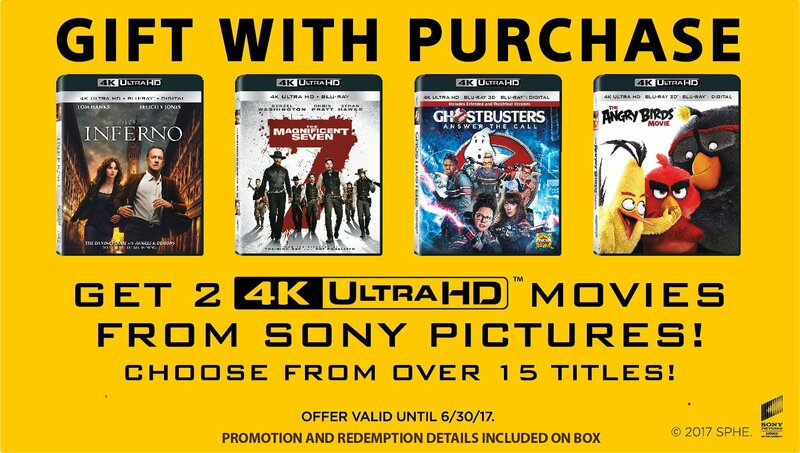 Just as some of our sound products are tuned by some of the best audio engineers in the business, select video and home theater products, like the 4K Ultra HD Blu-ray Player, are developed with collaboration from our colleagues at Sony Pictures." Sony's first 4K Ultra HD Blu-ray player allows customers to experience the full breadth of what Sony's 4K ecosystem has to offer. The UBP-X800 Player is compatible with Ultra HD Blu-ray as well as video streaming in 4K resolution and High Dynamic Range (HDR), for greater detail, brightness and contrast that fully captures the movie, TV show, or game as it was meant to be seen and heard. The UBP-X800 provides Ultra HD Blu-ray playback with wide color space BT.2020, which offers twice the color range of existing conventional Blu-ray players and HDR is up to 100 times dynamic range to enjoy realistic picture quality like never before. The UBP-X800 is also a great match to Dolby Atmos® and DTS:X® object- audio compatible receivers, for the most immersive home theater experience possible. In addition to support for Ultra HD Blu-ray, the UBP-X800 utilizes a Sony developed Precision HD drive to help maintain consistent performance with virtually every optical disc format, including DVD Video and DVD Audio; CD and Super Audio CD; and Blu-ray 3D, and BD-ROM media in additional to almost any format available via USB. The UBP-X800's specially designed Frame and Beam (FB) chassis increases structural rigidity and its honeycomb top plate, sf heat sync and offset insulator feet reduce the effects of airborne and mechanical vibration. This high quality construction contributes to Hi-Res Audio sound reproduction which can playback up to 192kHz/24-bit and DSD 11.2MHz1. For standard resolution music DSEE HX™ upscales the original signal's sampling frequency and bit-depth. And the UBP-X800 integrated Bluetooth® means it is possible to listen to wireless headphones while the sound can continue to play from the TV for the rest of the family in the room to enjoy, great for those that need a higher volume or simply don't want to be interrupted. The player further incorporates a variety of video codecs that can deliver 4K streaming from video streaming services such as Netflix, along with Sony's advanced video processing that upscales SD and HD content to near 4K resolution. Additionally, when playing 4K HDR content on a 4K SDR television the UBP-X800 utilizes a unique Sony algorithm to reproduce the proper brightness and color gradations to provide the best picture possible. The UBP-X800 4K Ultra HD Blu-ray Player will be available Spring 2017. Pricing and dealers to be announced. Building on Sony's fundamental amplifier design methodology, the STR-DN1080 Object Audio Compatible HiFi AV Receiver offers improved sound quality, flexible speaker solutions, and support for the latest audio formats such as Dolby Atmos® and DTS:X®. By combining Sony's "Phantom Surround Back" technology, you can enjoy 7.1.2ch speaker configuration with actual speaker setting with 5.1.2ch.The receiver also supports a long list of legacy surround formats, including Dolby TrueHD and DTS-HD Master Audio. To complement this, the STR-DN1080 includes Sony's latest sound field compensation technology, D.C.A.C. EX, which combines Advanced D.C.A.C.2 with Speaker Relocation. This technology balances output to closely simulate sound as would be produced by optimally positioned and angled speakers – even when the ideal configuration is not possible. The results are nothing short of breathtaking, with the entire sound field seamlessly integrated for outstanding surround sound. Besides delivering extraordinary sound for your home theater, the STR-DN1080 helps deliver optimal video with six HDMI inputs and two outputs that provide full HDCP 2.2 compliance and supports the latest 4K 60P (4:4:4. 3) Ultra HD content. It can also distribute both 4K video and multichannel audio simultaneously to two different zones. The STR-DN1080 is even compatible with the new BT.2020 wide color gamut broadcast standard. The SRT-DN1080 also supports High-Resolution Audio capability including DSD native playback and is equipped with USB, Bluetooth, Chromecast built-in, Spotify Connect and Wireless Multi-Room capabilities. The STR-DN1080 HiFi Audio Video Receiver will be available Spring 2017. Pricing and dealers to be announced. The new HT-ST5000 is Sony's new flagship 7.1.2ch 800W sound bar featuring Dolby Atmos®,, Hi-Res Audio and twelve advanced speakers—all in a sleek, stylish design. Each speaker unit utilizes separate drivers to reproduce a full range of sound that supports High-Resolution Audio playback. While a powerful addition to a television or projector all on its own, this sound bar is designed to be the cornerstone of a home theater setup. With three HDMI inputs, one HDMI ARC output, a USB input, Bluetooth, NFC, as well as digital optical and analog connections, there's a connection for all your equipment. The ST5000 maintains quality from source to screen with support for 4K and High Dynamic Range (HDR) content from major studios via HDMI HDCP 2.2. The ST5000 supports multi-room capability also works with Google Home4, a voice-activated speaker powered by the Google Assistant. With Google Home, you can voice control your ST5000 sound bar to turn up the volume, skip to the next track, or stop the music --all without lifting a finger. The HT-CT800 is a stylish sound bar with 4K and HDR support. The ultra-slim design fits seamlessly in just about any home décor, lying flat on a TV stand or discreetly on a wall. The powerful external subwoofer is wireless, providing more options for setup. While the CT800 might be thinner in size, it's huge on sound and features! With Dolby® TrueHD & DTS-HD® Master Audio format support, listeners can enjoy the uncompressed soundtracks of your favorite movies and TV shows – just as the director intended. For video, 4K HDR compatibility with HDCP 2.2 enables viewers to experience exceptional detail, color and contrast, even when connected through the sound bar. With three HDMI inputs, one HDMI ARC output, a USB input, as well as digital optical and analog connections, setting up and expanding a home theater is easy. The CT800 supports a wireless surround sound experience that allows listeners to add compatible Sony's wireless speakers as discrete rear surround sound speakers to enjoy an even more immersive cinematic experience. The CT800 also has multi-room capability, making it possible to stream to different rooms and listen to the same great music all around the house. With support for Google Home users can group selected Sony's sound bars and speakers together, then stream music in multiple rooms. It also has a Music Service button to carry on listening to the last song you played from your Spotify account. The HT-MT300 is an elegant and compact sound bar with soft angles and a choice of neutral colors designed to complement almost any space or décor. The slim wireless subwoofer stands neatly upright next to or in between your furniture to deliver clear, defined bass or can be used in Sofa Mode, discreetly under the sofa with no compromise to the sound through the cushions. In addition to great style there's great sound with the S-Force PRO Front Surround technology placing the listener right in the heart of the movies by emulating theater-style surround sound from only two front speakers. There's also support for Bluetooth and NFC as well as the ability to change settings and control playback from a smartphone. A USB port in the back allows you to connect USB devices for easy playback. The HT-CT290 is a stylish sound bar with a space-saving design that delivers room-filling sound with its 300W total output power. This Bluetooth-enabled sound bar brings movies and music to life with virtual surround sound and powerful bass delivered via a wireless subwoofer. Stream music easily from a smartphone and control your sound bar and TV with a single remote, all in a stylish, slim design that lays flat or mounts discreetly on a wall. The HT-ST5000, HT-CT800, HT-MT500, HT-MT300 and HT-CT290 sound bars will be available Spring 2017. Pricing and dealers to be announced. Sony is exhibiting at the CES Sony Booth # 17300. To follow the online conversation use #SONYCES. For more information, please visit www.sony.com/ces. 4 Google Home works with Sony's speakers with Chromecast built-in. (Models HT-ST5000, HT-CT800, HT-MT500 and STR-DN1080) Chromecast and Google Home are trademarks of Google Inc.
PMF and Robert_Zohn like this. No mention of Dolby Vision support. Interesting. Yet another UHD Blu-ray player that supports 3D Blu-ray - perhaps Sony will keep 3D in their 2017 line of 4K TVs. 800 is up for preorder on Bbuy with a 2/23 release. I have it preordered now, as well as the new LG UHD player with Dolby Vision from Value Electronics, which should ship end of month. I generally try several players every year, trying to find one that plays back reliably and offers HDR from both Amazon and Netflix. The 900 I have right now is great, and produces a lovely image on Netflix, Amazon and discs, just does not have Amazon HDR support. Coming in at $299, the new UBP-X800 Sony Ultra HD Blu-ray player is impressively responsive, delivers a very nice picture, and will also process HDR (High Dynamic Range) content for maximum effect on SDR (Standard Dynamic Range; aka everything else) TVs. The effect was noticeable, with greater detail in dark and light areas, though I saw a limited amount of content. The UBP-X800 chassis is quite heavy, which might not be good in a cell phone, but is generally considered a good thing for isolating vibration when playing any type of disc. Audio and videophiles generally appreciate heft in equipment; especially here in earthquake country (or is that Oklahoma now?). The other news is that unlike some of last year's players, the Sony is firmware upgradeable to support Dolby Vision. Dolby Vision made a big splash at CES this year, with a host of new vendors climbing onboard. Looks like you will be able to get TWO free UHD movies with this from Sony, so makes a $299 price even better. New shipping update, appears to be shipping today because my account now says get it by feb 23 instead of ship by feb 23. But it isn’t just physical media that it can play. The UBP-X800 has all of the software and hardware necessary to enjoy streaming content. You can watch 4K HDR content form Netflix and Amazon Prime. If you’re enjoying any 1080p content, the built in digital video processor can help you upscale it to 4K resolution. After a lot of careful research, we did find one format that wasn’t supported: Dolby Vision HDR. This is one of the four HDR standards that are available on the market. The others are HDR10, HLG, and Advanced HDR. The differences between these formats is, for the most part, minute. But Dolby requires special hardware and a software license that manufacturers have to pay to use. Your TV has to be Dolby HDR certified, as do your media players. You won’t be able to stream Dolby HRD content from a computer. Should Sony support this video format? Unfortunately, there is no clear answer. But there is a solution. Sony has all of the necessary hardware to support Dolby HDR, and they’ve stated that they’ll be watching the market. If this becomes a prominent standard in the marketplace, they’ll offer a firmware update to allow this content to be played back. For now, there is not much content available, so we don’t think you’ll miss it. But if you have already paid for a Dolby HDR television, you might want to consider a player that can support the format. Shipped today, will receive Friday. I will not be able to do any testing until Wed of next week, but Ill post some pics and observations then. Sony don't screw the pooch, otherwise, you'll be in deep crap like Oppo. Im looking for streaming apps, if they don't have Netflix and Amazon in HDR, Ill return it and keep my Panny 900. It's been bullet proof so far other than not having Amazon HDR. I was thinking about getting the new Sony for my Living room set. The price point, and free movies is tempting. However, I think I will end up getting another Panasonic. It has been the main reason of getting back into audio CDs. So far, the best player I have ever owned. I am also looking at the Oppo though. I have read it is just as much an audiophile machine as well. Please continue to post your impressions on this player as you test it out. I have a 10% off coupon with Best Buy that expires on 3/3/17, so I am considering pulling the trigger on this player if it has no major glitches. I would like the Oppo, but it's about twice the price after the $30 I can get off the Sony. Where can I find a list of the 15 title choices for the two free UHD disc offer? The redemption page at Sony will not display a list until you enter a redemption code. Does it support 3D? Without this it is just a boat anchor to me. There is a list @ Amazon,but I only could see it with the ROKU Ultra 4k player. Even if you know a title u need the ROKU 4K ? Funny Girl, and L. Of Arabia are listed. L.O.A. will be the first filmed in 70mm to be on 4k! CAN'T WAIT! Also can't wait 4 VISTA VISION on 4k !!! Here we go again. Former projectionist @ all downtown theatres in Balto. City.Which are all closed. I closed the Tower theatre as the head projectionist, I closed the Mayfair as mgr.